Easton’s flagship baseball bat line for 2018 is the Easton Ghost X. The Mako is no longer. We have watched players swing the new Ghost X at length. As well, we spoke to the manufacturer and major vendors about the bat. That information, combined with our extensive experience in evaluating bats, drives this 2018 Easton Ghost X Review. We aren’t the only ones to have information about the Ghost X. Other places, in particular those who sell bats, usually have a boiler plate write up on the specs of a bat. Many of those we reference to make sure we are seeing what we should be. Here are some more references for the 2018 Easton Ghost X review. 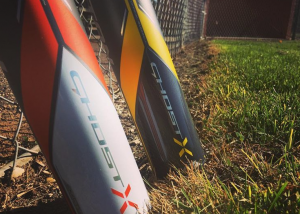 The Ghost X recommendation for 2018 depends on what class of bat you are looking for. Generally, the BBCOR and USSSA versions of the bats are highly recommendable. The USA version in the drop 10 struggles to impress. But, the drop 8 and 5 USA Ghost X are decent bats. Easton’s production of the 2018 Ghost X in so many models makes it difficult to give a blanket recommendation to all. The type of hitter who would like the BBCOR Ghost may very well not be the same type of hitter as the one who prefers the drop 5 2 3/4 Big Barrel. As a general rule, the more elite hitter you are, the less you prefer two piece bats. Single piece bats, especially aluminum ones, transfer more power to the ball. Hitters who struggle to consistently find the sweet spot tend to prefer the smooth smash of a two-piece bat. Something was wrong with this bat in the drop 10. And Easton, we think, fixed much of that in the 2019 Ghost X Evolution. But, the hand sting on the 2018 Ghost USA Bat in a drop 10 was trouble. Very few people liked it—although there were some exceptions to this. Excerpt the inventory on this bat to be around for a long, long time. The USSSA Ghost is X is a monster. Especially in the drop 5 and drop 8’s, expect a huge bat with massive pop. Several serious travel ball players feel like it is the best drop 5 on the market today. However, for them, budget is not so much an issue and they like the feel of a two piece bat. In terms of overall set up, the 2018 Ghost X and 2017 Mako Beast are similar. That is, they are both two piece composite bats with a big barrel and a light swing. However, there are considerable upgrades to the composite structure Easton uses in the Ghost, insomuch that calling it a Mako wasn't fair. The new composite structure used to design the Ghost intends to extend the length of the sweet spot. Note, this isn't a claim the barrel is larger. Instead, the claim is the new composite structure allows for a longer sweet spot on the same sized barrel. For the record, the MAKO Beast had one of the largest barrels on the market in 2017. So, the 2018 Ghost X having a barrel just as big, if not ever so slightly bigger, means it is still huge. As well, Easton claims to have updated the connective piece. It is no longer the CXN which has been on the MAKO since its inception. Instead, it is referred to as connection+. The idea is a more durable connective piece via some redesigned innards. In terms of a two piece composite bat with a light swing, robust model offering and prestigious pedigree, you’ll struggle to find a bat similar to the Ghost X. The arguable competitor is DeMarini’s CF Zen. Others may very well add in the 917 Prime from Louisville Slugger, but we think that a stretch. In terms of a two piece composite bat with a light swing, the world is your oyster. Virtually every serious bat company makes a two piece composite bat, including Marucci (Hex Connect), Axe (Avenge), Rawlings (Quatro) and the likes. We spent considerable time with the 2018 Rawlings Quatro in both real game work as well as cage time. We hit with the 918 Prime for an entire season. One of our BBCOR players used the 32/29 during his high school play. Our 2018 Easton Ghost X USABat review comes on the heels of hours of hitting, testing, measuring and discussing the bats performance. While most players will be disappointing in the general performance of EVERY USABat (especially compared to previous BPF 1.15 models) the Ghost X in a USABat has the familiar feel, sound and balance most have come to love, and are willing to pay a premium for, in the performance bat. Note: The 30/20 version of the Ghost X in USA Bat has been deemed illegal. Generally, there is no difference between the Ghost X in the USABat space when compared to that of the BBCOR and USSSA space. That is, the Ghost X is a two piece composite bat built with a big barrel, light swing and a very smooth feel on both hits and mishits. Time will bear out what general design the USABat market tends to favor. Most have their bet on the two piece composite market where USSSA bats aslo tend to do remarkably well. Youth players tend to require the lightest swing for the most amount of barrel on a bat that also doesn’t destroy your thumbs on mishits. And, traditionally, two piece composite bats (like the Easton Ghost X) have fit that bill. We think the dark horse in the general USABat space may be two piece hybrid bats like the Easton Beast X. Aluminum barrels may have a slight advantage in the USABat space as to deliver more mass at contact. However, the increases in MOI might be too much to handle for some. Time will only tell how the swing weight and swing speed tug-o-war will play out in this newly minted bat category. In the beginning, there are three two piece composite bats in the USABat space. Those include the Easton Beast X, the Rawlings Quatro and the Mizuno Ghost. By January of 2018 there will be four as DeMarini plans to add a CF Zen to the mix. As time goes on more two piece composite bats will be added to the mix. Our hitters have preferred the Easton Ghost X over the other two two-piece composite bats in the space, but it has been close. The Mizuno Ghost has a larger barrel and the Rawlings Quatro feels fantastic at contact. Athough we think both worthy competitors to the Ghost X we think Easton’s two piece composite USABat’s combination of a smooth feel, massive barrel, great balance and performance testing to give it the edge. Turns out, though, it is also more expensive. The Ghost X is a two piece composite bat built with a big barrel and a light swing. Depending on the drop, the barrel size tends to be larger than average. It comes in a number of sizes and drop options. It is, for all intents and purposes, Easton’s flagship bat for 2018. It uses a connection piece called the CXN and delivers generally good feel on contact in the BBCOR and USSSA spaces. Easton will produce no less than six different Easton Ghost X bats. They include a BBCOR, drop 5 2 3/4 as well as a drop 5, 8 and 10 in a 2 5/8 barrel. The USA version will be chalk full too. Expect a drop 10, 8 and 5. Also, just to confuse us, the Ghost X will also come in a Hyperlite version. This bat is different enough to deserve its own review and you can expect that to be on our site. The Hyperlite is a single piece composite bat. I initially bought the Easton Ghost X drop 10 for my 11 year old son. After reading many reviews I purchased a DiMarini Voodo USA bat. My son goes back and forth and likes them both. The pop of the Mako is gone! People who are looking for pop of the Mako’s will not find it in any bat. I think the Easton Ghost X will prove to a very durable bat.